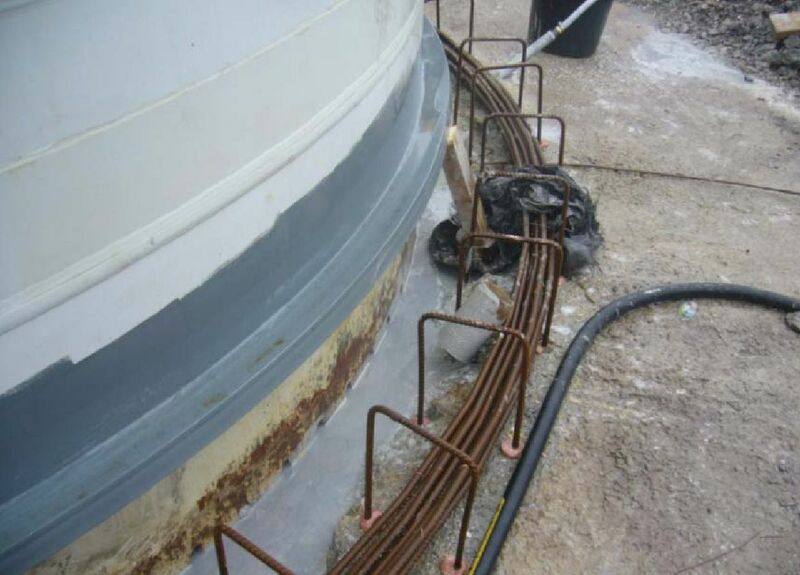 The purpose of the remedial works in a damaged wind turbine foundation is to provide an alternative load path. Other operation that are normally done are injection of mortar or resins in the cracks and water sealing. Here you have an example of remedial works in case of foundation failure and subsequent tower movements. The works was done several years ago in Ireland by Densit, allowing keeping the existing foundation (that is, saving around 90% of the cost of a new foundation). If you wonder how much does it cost a WTG foundation, the figure is around 100.000€ plus turbine disassemble / reassembly plus monetary loss due to stop of production. 1. Arresting the movements by fixing the tower. Before remedial works movement was around 5 cm. 2. 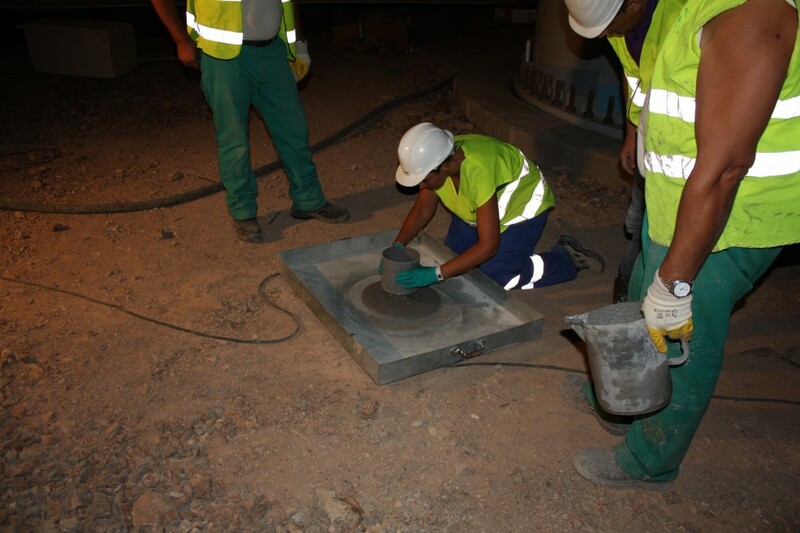 Drilling of injection holes on both side of the tower and inspection. 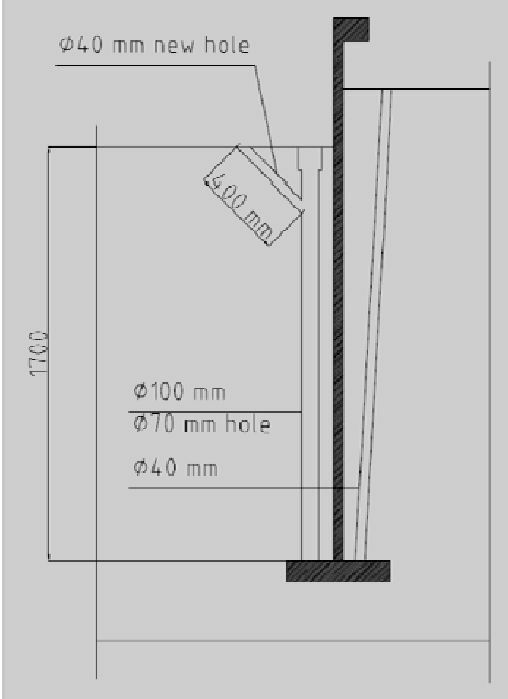 Due to the lack of bearing capacity of the embedded flange, a new flange is welded on the outside of the tower to withstand the compressive forces. First of all, several clamps are installed all around to arrest tower movements while grouting. 8 injection holes are outside the tower while other 8 injection holes are inside of the tower, and a camera survey allows inspection of foundation condition. 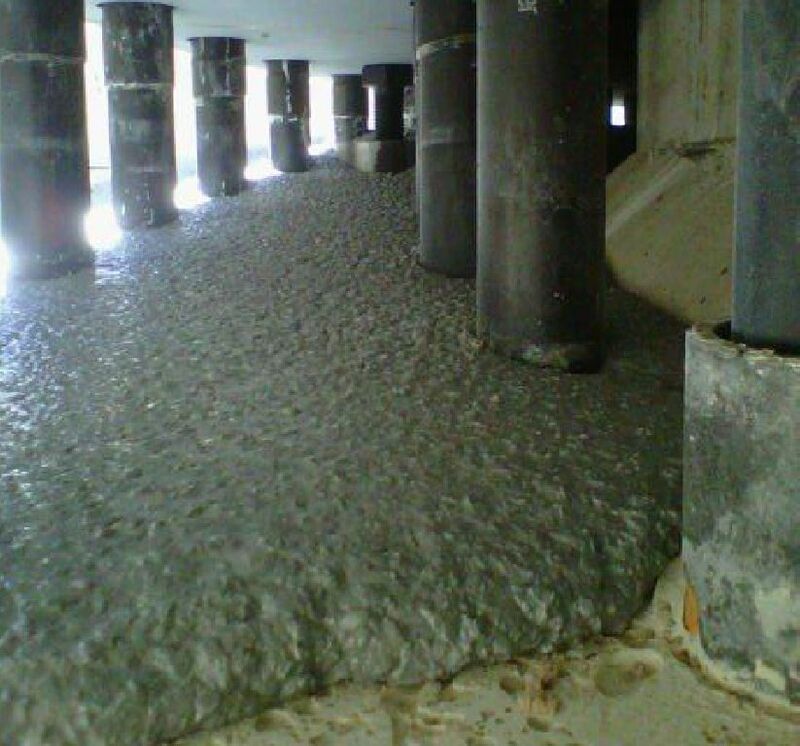 Then, an ultra-high performance grout is injected and distributed in the foundation through the inlet holes and along the voids around the embedded flange and tower. This product hardens quickly, obtaining around 50% of the compressive strength after only 48 hours at 10°C (the warmer the climate, the quicker the grout hardening) allowing the removal of the clamps. 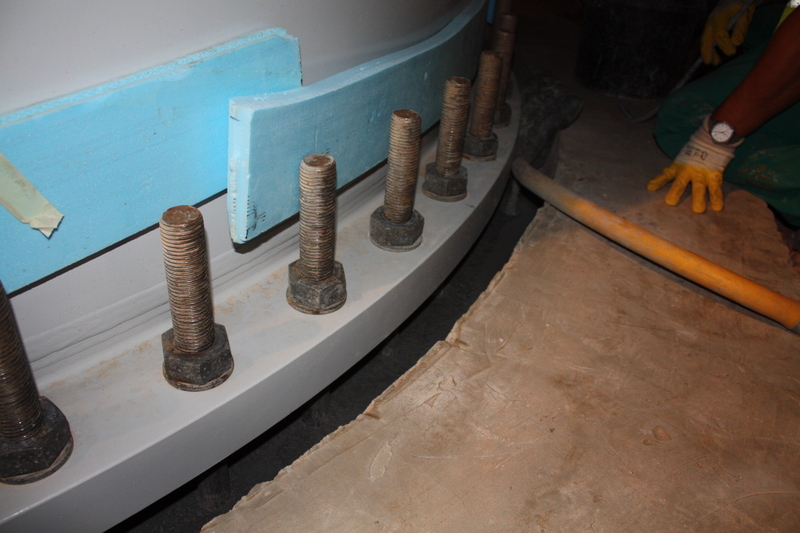 Finally, a reinforced concrete ring is casted around the foundation below the new upper flange. The reinforced bars are seen on the picture. 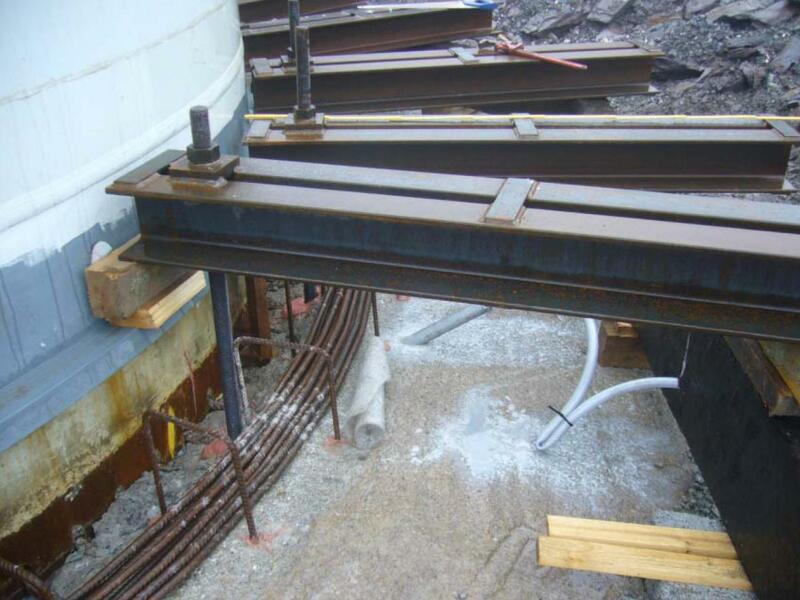 A shuttering is constructed on both sides of the reinforcing bars and concrete and the high resistance grouting is casted under the new flange. Grout is an extra high properties material that is normally used in wind farm construction just below the tower flange, above the foundation. It is a transition material, designed to have a very high fatigue resistance. All the dynamic loads need to be transferred and absorbed by the grout connecting the tower to the foundation structure. 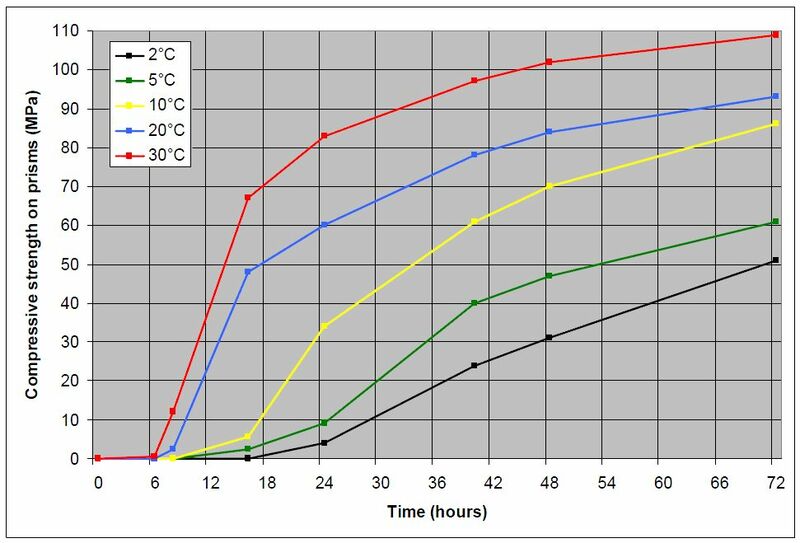 Grout is volume stable and his resistance grow very quickly (it is faster than normal concrete in achieving a relevant percentage of his final value, and it has a very low porosity and water absorption. 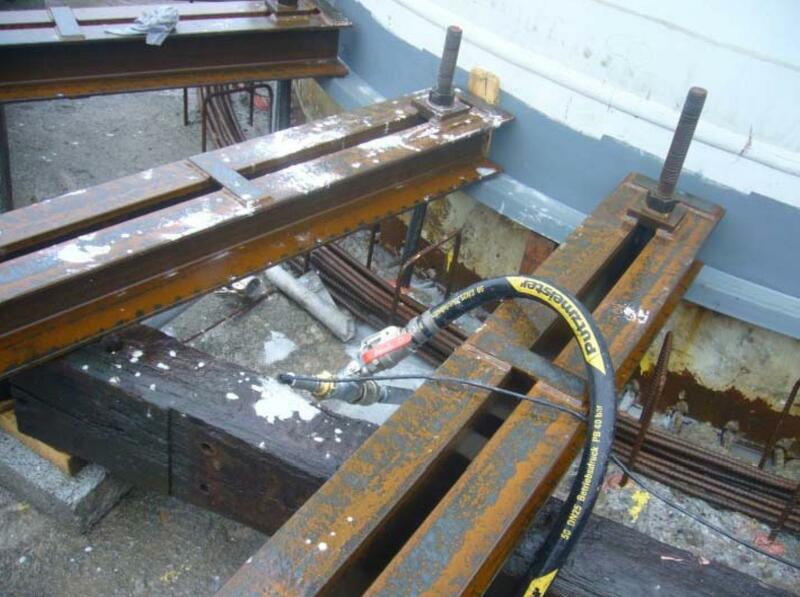 Thanks to the rapid strength build-up, it allows earlier pre-stressing of anchors at all temperature ranges (it is normal to work between 2 and 30 degrees): a short hardening time permit a short overall installation times and earlier operation of the wind farm. In the picture you can see how it is prepared. We are working by night, because the temperature was real high during the day (more than 38 degree). In cold wind farm we need to use thermal blanket to keep the grout warm. First of all pipe are lubricated with standard Portland cement slurry. 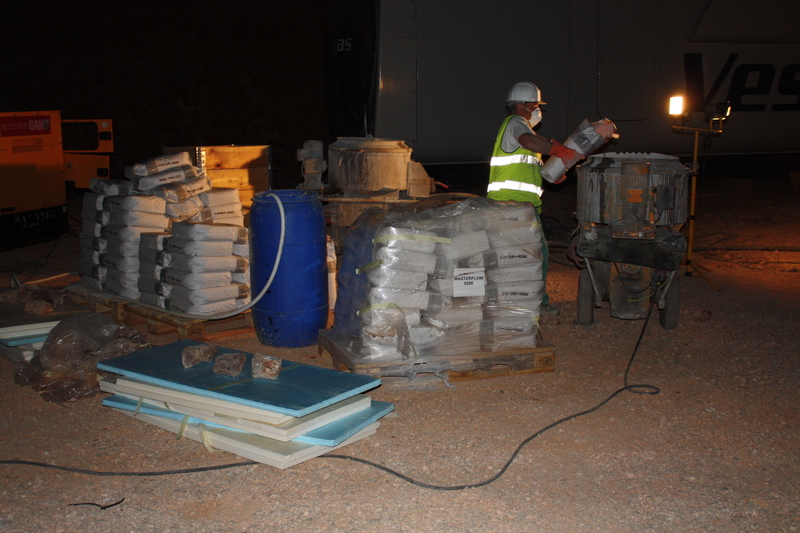 Then, grouting is prepared in the mixing machines. We are using 2 machines in parallel because mixing time (minimum 7 minutes) is about 2 times the time needed to empty the mixer. Water consumption was 2.25 liters for every 25 Kg grout bag. After the grout is tested: a “pizza” is made to see if the viscosity is right (not too dense, not too liquid). The technical name of the test is ASTM C230 ring. When it’s considered ready, the small channel between the tower and the foundation is quickly cleaned and the grout is pumped from the highest point of the circumference (it should be leveled, but there are always small difference in elevation. It can’t be vibrated, so a steel rebar is used to shake it a little. We needed around 2 hours to fill the channel. At the end of the work, pipes are cleaned pushing a sponge inside them to remove the rests of grout. Testing is normally made with 12 75 mm cubes, although cylinders are considered acceptable. There are numerous producer of this material. In this wind farm we used chemical giant BAST “Masterflow 9200” grout designed specifically for Vestas. We employed around 96 x 25 Kg bags (2400 Kg).